1 - Share our Story. Share our story through email, Facebook, text messaging. The more people who are aware of our cause, the better chance we have to increase our resources and opportunities for students. Join our volunteer team today ! We are looking for volunteers who are willing to make a one year commitment. Volunteering with our school, provides a unique opportunity to live, travel, and work in Honduras. 3 - Donate Materials and Supplies. 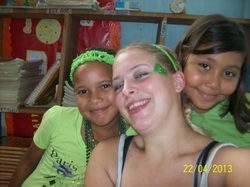 Blanca Jeannette Kawas Bilingual School needs an assortment of materials and supplies for our school and our students. Any supplies that you can donate are greatly appreciated and will directly impact our students. Supplies also help assist our international native-English speaking volunteers with their daily lesson preparation. We are in need of the following items: English reading books; English educational books; English school textbooks; school supplies such as white board markers, pens, pencils, crayons, pencil crayons, coloring markers, erasers, sharpeners, notebooks, glue, scissors, scotch tape, sticky tack and foam tape for cement walls, paper clips, staplers, rubber bands; construction paper, colored paper, poster paper; maps of the world and specific continents. Blanca Jeannette Kawas Bilingual School needs an assortment of equipment for our students. Any equipment donations that you can provide are greatly appreciated and will directly impact our students lives. We are in need of the following items: desktop or laptop computers; copy/fax/scanner machine; musical instruments such as recorders; sports equipment such as soccer balls, basketballs;CD/DVD players; projector and screen. Any amount of money you can give will go directly towards enrollment and tuition fees for students. This greatly helps the school by enabling us to direct the remaining money we have, towards fulfilling other needs of the school. You can also choose to directly sponsor a student scholarship by choosing a specific student to support for a full school year or for partial tuition. We currently have 30 students with sponsored scholarships, but the remainder of our students are still actively seeking sponsorship.